What types of complaints are treated with the use of acupuncture? What can I expect when visiting the clinic? What is the relationship between acupuncture and other medical care? It is likely that more people have been treated by Chinese medicine throughout history than by any other formalized system of medicine. This model of medical practice is based on natural laws describing the movement of life energy in nature and the body. This life energy called ch'i courses through the body in channels similar to rivers that course through the earth. When the ch'i is moving disharmoniously, illness can begin. Our intervention treats the underlying imbalances rather than only the most obvious symptoms. Acupuncture is often effective with a wide range of complaints, including headache, allergies, chronic fatigue, depression, back pain, digestive disorders, sleeping problems, asthma, addictions, and stress. What can you expect when visiting the clinic? Subsequent visits last forty-five to sixty minutes. Initially you will be seen weekly, in order to create an internal balance or harmony which can be maintained between treatments. As this balance is achieved, usually after eight weeks, treatments are extended to every other week, then monthly, and eventually seasonally. Of course, frequency of treatment varies with each individual. Treatment fees are consistent with other medical care. While acupuncture is concerned with the whole person and addresses itself to many levels of functioning, it is also a form of treatment with its own limitations. It needs to be used in conjunction with other health promoting practices. Acupuncture practitioners cooperate with other health providers and do not recommend altering medications or other therapies without consulting the personal physician or provider. Acupuncture needs are solid, stainless steel and slightly thicker than a human hair. They bear no resemblance to hypodermic syringes. Only the finest quality, pre-sterilized, disposable needles are used. Most insertions are made just beneath the surface of the skin, and sensations vary from person to person. Sometimes a person feels nothing at all, or perhaps a dull momentary ache or tingling sensation. Only a small number of needles are used for most treatments. 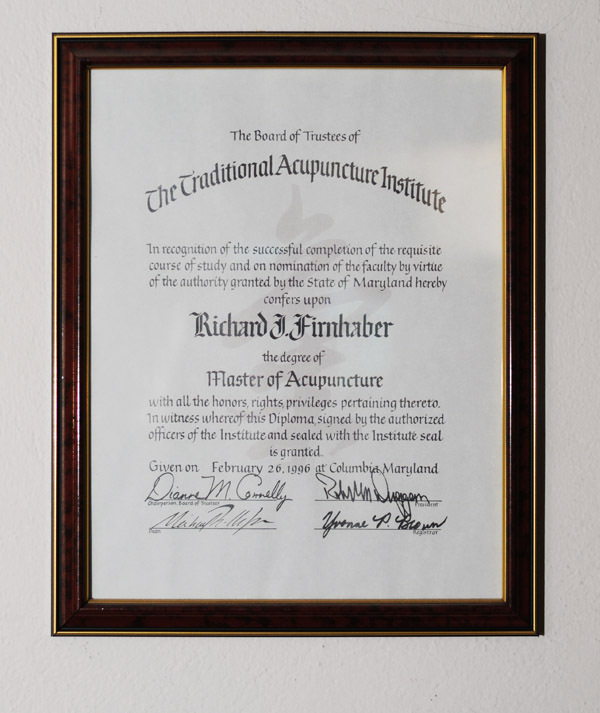 Mr. Firnhaber has been in practice since 1972 after graduating from temple University in Philadelphia, PA with a B.S. in Physical Therapy. 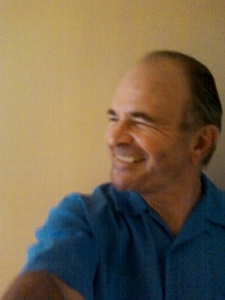 He began the study of acupuncture in 1982 and received the degree of Doctor of Acupuncture in Hawaii in 1987. In 1995, he graduated with a Master of Acupuncture in the Five-Element tradition of acupuncture from the Traditional Acupuncture Institute in Columbia, MD. Mr. Firnhaber is a diplomate of the NCCA. We invite you to schedule an initial visit and to begin treatment. If you have specific questions about what acupuncture can offer you, please call 267-934-9953 or use our Request for Information form.